from Sathya Sai Baba's DISCOURSE ON GURU PURNIMA, July 24, 2002. The text below also appears in a different edited-down version in Sanathana Sarathi - August 2002. The following is an excerpt from the verbatim translation of the premsai website's version. His struggles in the following to stick to his chosen subject - atoms and more atoms to impress the punters - by having to keep going and reeling anything off the top of his head, and somehow to introduce and beat to death his favourite hobby-horses with codswallop, is pathetic. If it were not for what else he does and pretends, if it were not for all the lives he ruins and half-ruins (a subject no one in his favour likes to talk about), we would leave this clown to his own sub-intellectual devices in his divinely-decorated dunce's corner. Alas, the time when we could let it pass have gone, unfortunately, but then it is not our fault at all! Physics has demonstrated that in the hypothetical environment of the big bang at the very beginning it was impossible for atoms to be formed. It does not matter how close atoms are, heat is not generated. In the nuclei of the atoms of some elements there is potential energy that can be released through fusion or fission. “Due to this heat, an enormous sound came about.” There can be no sound in the vacuum. “… all of these densely combined atoms broke apart and spread everywhere. The sound of that breaking is Pranava, Omkara, which is the Primordial sound. This only is the original and first sound. This Pranava is present everywhere. What did this Pranava arise from? It began from atoms. There is nothing else except atoms. ”There are many more things than atoms, like neutrinos (some scientists think that they account for the majority of the mass of the universe), energy (photons, X rays, gamma rays, microwave radiation, light, etc), loose particles (electrons, protons, muons, etc), space-time, etc. “He taught such a truth to the world. Only after the sound of Omkar began, the sun, moon, earth, sky and stars all arose. ”Stars are forming all the time, the Sun is a second generation star. There is strong evidence also that many stars have planets revolving them. That does not have anything to see with sound. “However, how should one take hold of it? The process of the microcosm has to be undertaken. This is what Kaanaada said. He said that when this (the process of the microcosm) is followed, it would be possible for us to receive (realise) the principle of Divinity.”And just because Kaanada said it, then it is true? How come that the powerful SSB did not know what he was saying?? The mind is beyond matter so how come that it is formed of atoms, which kind? How come that the mind has atoms and the atoms give life? It is not possible to say that this mind is ‘like this or that’. Therefore, we should not feel that the mind will die along with this life (of the physical body). No matter how many births there are, the mind is God. This mind contains atoms. We should not feel that the nature of the mind, which contains atoms, dies. But the body that really has atoms dies! 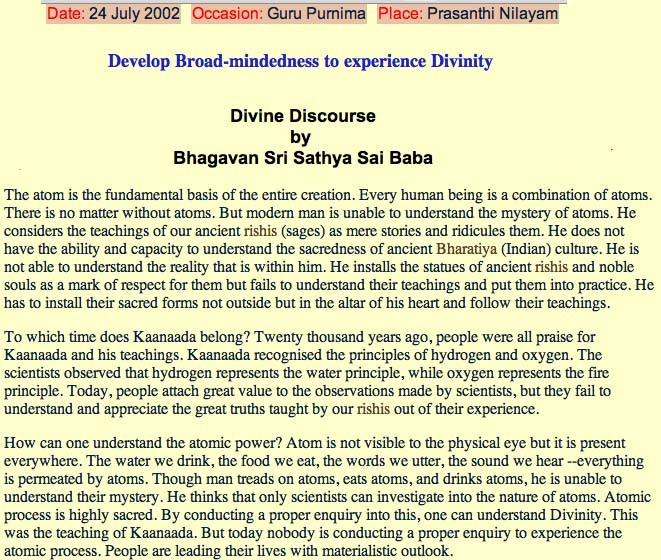 When SSB gives diamonds (fake or real) he usually says, "Die mind"
Strangely, however, there is yet another Guru Purnima Discourse from July 24th on the atom, which differs from the one analysed here.